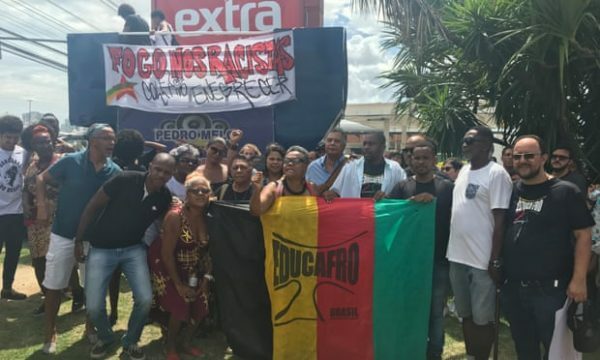 Black Lives Matter protests have erupted across several major cities in Brazil following the death of a 19-year-old black teen who was “suffocated” to death by a supermarket security guard. Activists have taken to the streets in what they’re calling the beginning of Brazil’s own Black Lives Matter movement. “We have to take a position against this to stay alive. It’s a basic issue,” student Lyz Ramos, 19, told The Guardian. The unrest began outside the Extra supermarket in the upscale Barra da Tijuca community of Rio de Janeiro following the death of Pedro Gonzaga, who died of a heart attack on Thursday after being placed in a “sleep hold” by security guard Davi Amâncio. News of Gonzaga’s death sparked the hashtag #VidasNegrasImportam (Black Lives Matter) as many Afro-Brazilians have compared the teen’s death to that of Staten Island man Eric Garner, who died after an NYPD officer placed him in a chokehold during his July 2014 arrest. Garner’s final words, “I can’t breathe,” became a battle cry for the U.S.-led Black Lives Matter movement. But despite the protest, Brazilian newspaper O Globo, claims the teen was being taken by his mother, Dinalva Oliveira, to a rehab clinic when they stopped by the supermarket for lunch. They claim Gonzaga had an emotional fit that led to his encounter with the guard. But witnesses and protestors say this is not true and Gozanga’s mother can be heard in the video shouting that her son is unarmed. Press play below for the shocking video.